I’m a retired Lieutenant Fire Fighter. I have also been a professional model maker since 1982. I built my first model when I was 6 years old. When Star Wars came out, since I like building models and I like movies, I decided I would combine the 2 into a career. I worked as a practical effects miniature and special effects rigger in the commercial and film industry in the New Orleans area. I worked with a computer controlled motion control camera sytem until CGI Computer Graphic Imaging took over the special effects industry. 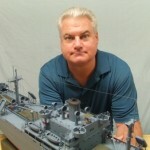 My hobby interests are predominantly US Navy/USMC Aviation, especially WWII, but will build anything that inspires me and recreating dioramas.